Last night, we opted to keep dinner simple and go for some take-out from the local Chinese restaurant. We'd eaten completely serviceable food from them in the past. We were not quite as lucky this time; some dishes were fine, but others were not at all good. 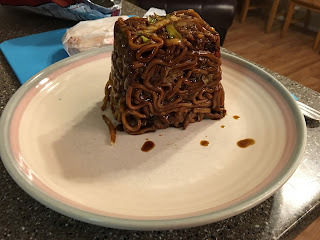 My beef lo mein arrived in a little box and was sticky enough to retain its shape without the box. The stickiness affected its flavor, with the sauce overpowering everything else. Beef lo mein also should not behave like quick-set concrete. As has become a tradition, I'm wrapping up the beach reporting with a happy snap of all the movies we watched on Blu-ray discs and/or DVDs. 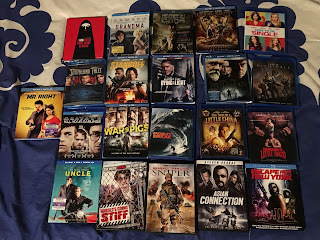 A quick glance should make clear that we watched some cult classics, some recent movies, and a variety of older flicks. To me, the winner of the Most Surprisingly Good Award of this year's trip is the disc alone on the left, Mr. Right. Don't look it up, and don't try to learn more about it; just rent or buy it, and then watch it. Give it 20 minutes to earn your love. I found it a wonderfully charming film. I hope you do, too. I always think big trouble in little China is under rated. Gods of Egypt tempts e as I like all things Ancient Egyptian but I'm afraid I might be disappointed. I agree the Big Trouble is under-rated. I think you might find Gods of Egypt amusing but definitely not great or in any way accurate. It is true. We are finishing off the last tiny bit of Bobcake here at home. It is a fine treat!